Also coincidentally, my wife and I decided to abandoned Apple hardware and services for Google gear and cloud about a week earlier. How odd that the bum keyboard made her switching all that much easier. On June 7, 2018, I purchased the first of two Pixelbooks; Google offered a $250-promotional discount on the Intel Core i5 model with 8GB RAM and 128GB SSD. 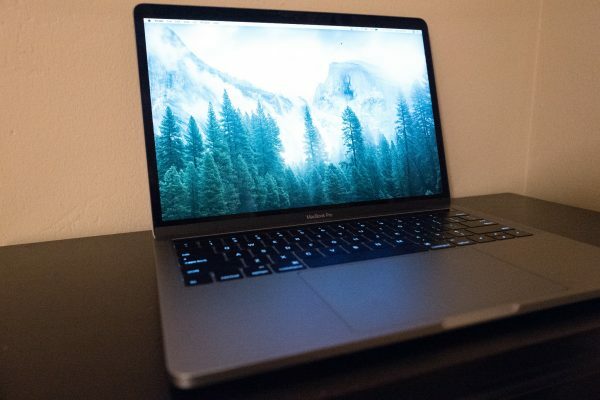 The MacBook Pro has a faster processor, twice the memory, and four times the storage. I made a Genius Bar appointment a week ago today for August 22. On the twenty-first, I backed up all the data from the laptop and factory-refreshed the OS. The next afternoon, an Apple specialist told me that the repair could be completed in the store. First attempt would be the spacebar. If that wasn't resolution, the entire keyboard would be replaced. But the repair was much more involved and rewarding, because of the computer's design. Apple techs did replace the keyboard, which also meant the entire top panel that also includes the palm rests, speaker grills, and trackpad as a single unit. Better still, I was told during the pickup that the battery is attached to the keyboard, making the repair a major hardware refresh—potentially increasing the resale value, too, or so I hope. As I write, the laptop is posted on Craigslist but with no nibbles yet. If there are none in a day or so, I will likely keep the laptop for macOS Mojave testing and sell the 15-inch MacBook Pro with Touch Bar instead (it's a screamer with 2.7GHz Core i7 quad-processor, 16GB RAM, 2GB Radeon Pro 455 graphics, 512GB SSD). Surprising: How much more satisfied I am with the other Pixelbook (i7, 16GB, 512GB). By configuration, there is no comparison which laptop should be better. But user experience is sum of many attributes. While Chromebook can occasionally frustrate, and there are some application-task limitations, the "less is more" principle applies. All that said, I commend Apple Store for giving more than promised with the repair—and for making a program available to fix problems for free. Still, no keyboard replacement should have been necessary. That, reportedly, particles as small as dust can cause Butterfly keyboard failure must be first and foremost regarded as a design failure. It's not the first, second, third, or even fourth time in recent years where some hardware problem emerged in a freshly redesigned Apple product. Now why is that?